Modern Whimsy Events designed a romantic bohemian setting filled with earth elements at La Rio Mansion. We decked the table out with brass candlesticks, florentine and gold trays, white china, purple goblets and vintage gold flatware. 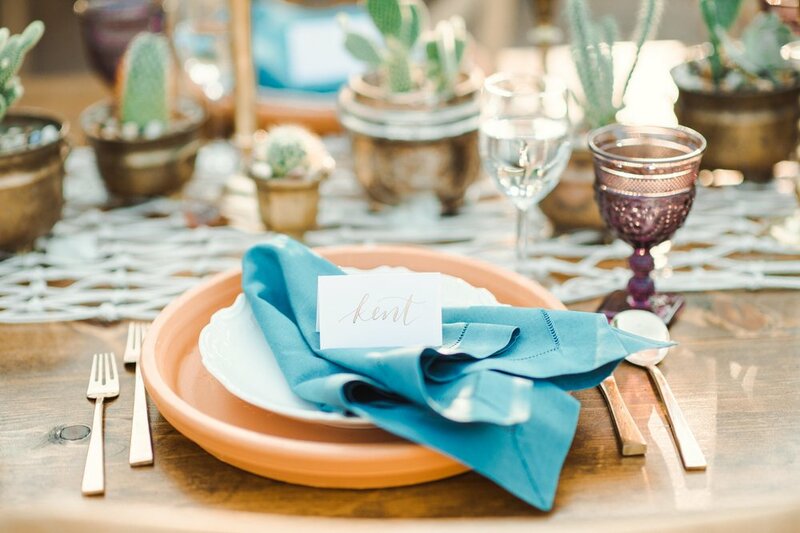 Also adding to the table Marquee Event Group provided linen napkins for each place setting, complete with terra cotta chargers, along with stylish furniture to match. The air-plant boutonnieres complemented the bridal bouquet filled with fresh greenery and soft blooms by Lovely Leaves Floral Design perfectly. I’m kind of have a crush on the sweet rock crystal topped cake and cupcakes from Green Lily Bakery and the lavender watercolor invitation suite and hand-written calligraphy place cards designed by Archer and Olive. The arbored ceremony scene was adorned with hanging macrame handmade by Modern Whimsy Events matching the runner on the table. The bride looked boho-chic in her stunning butterfly-sleeve lace gown from Blush Bridal Lounge, and My Style Team polished off her look with natural makeup and a soft, twisted, half-up hairstyle. Many thanks to Lindsey Mueller Photography for capturing all these lovely details.